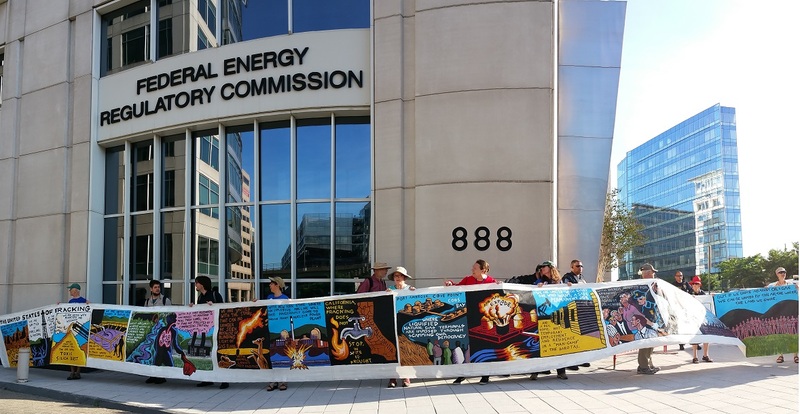 Residents of communities affected by FERC approved projects in New York, Pennsylvania, Maryland, Virginia, West Virginia, North Carolina, Massachusetts, Connecticut, the District of Columbia, and as far away as Iowa, California and Maine have joined the protests. “Most of the commissioners and employees either were in the oil and gas industry prior to working at FERC or will be moving on, or have moved on, to oil and gas positions,” Laity-Snyder said. “It’s like a fox guarding the hen house. How are we to be sure that our concerns are heard if they’re listening to the oil and gas companies? Thursday’s protests were conducted in solidarity with the divestment movement, which calls on institutions to remove their investments from the fossil fuel industry. After the days protests finished, participants convened at Union Station to help Divest D.C. pass out information to the public. 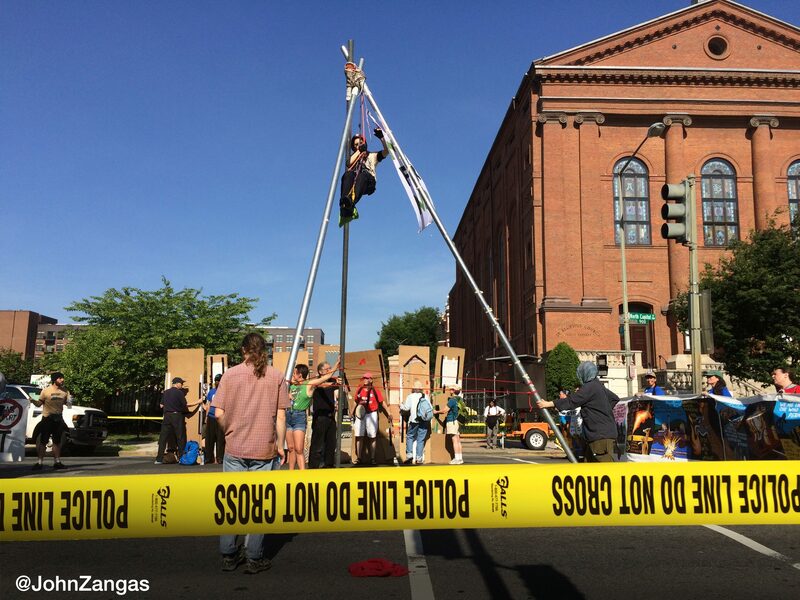 Protests will continue tommorrow, and the #FERCcupy is expected to continue tonight and through tomorrow. In the second action of the day, having been followed by police during the morning, at 9 AM protesters from Beyond Extreme Energy (BXE) entered the lobby of the Interior Department, at 1849 C St. NW., Washington DC and staged a sit-in.They are protesting the decision of the Interior Department and the White House to permit oil drilling in the Arctic. Their chants – “Hey, Obama, we don’t want no Arctic drama!” and “No Arctic drilling!” – echoed throughout the main building of the Interior Department. , Continuing their protest, they picketed outside the Interior Department building. BXE’s non-violent direct action protests will continue today. 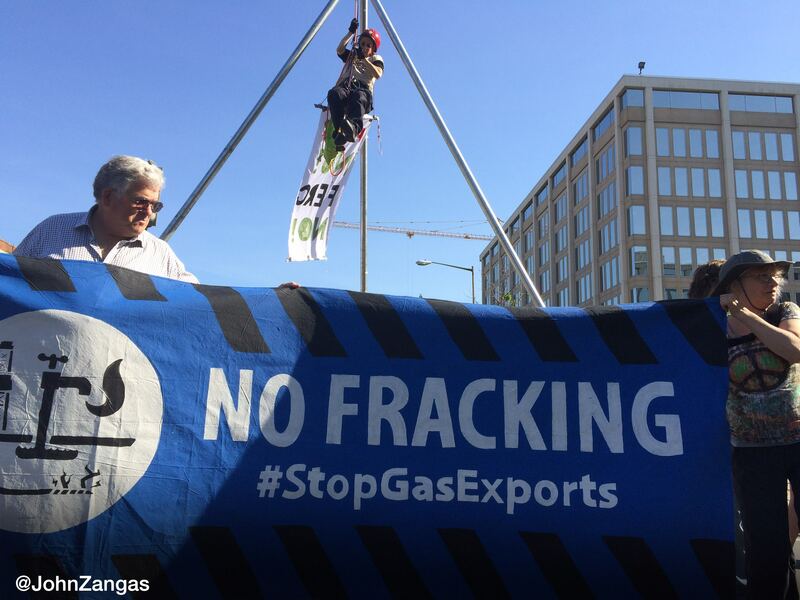 These protests are a continuation of nine days of protests that BXE is conducting at the Federal Energy Regulatory Commission and elsewhere in the District to protest the Obama Administration extreme energy strategy, which includes fracking, Arctic drilling and offshore deep drilling. Washington, DC, May 21. 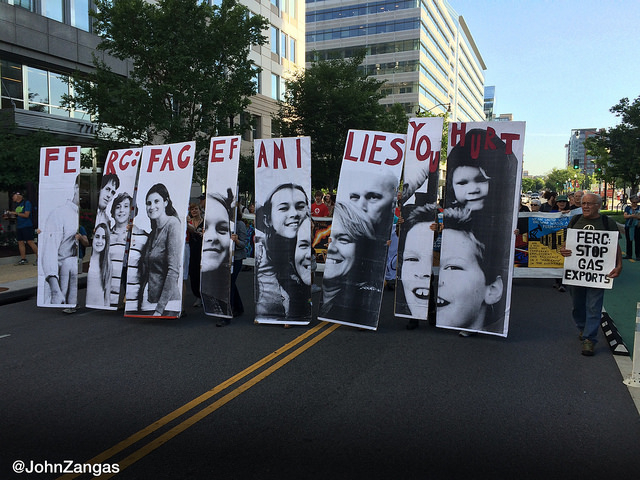 Today dozens of chanting and picketing citizens and grass-roots groups converged on Washington D.C., coming from across the Mid-Atlantic states, and as far away as Massachusetts and Ohio, and braving the rain to have a die-in on the sidewalk outside the headquarters of the Federal Energy Regulatory Commission (FERC). 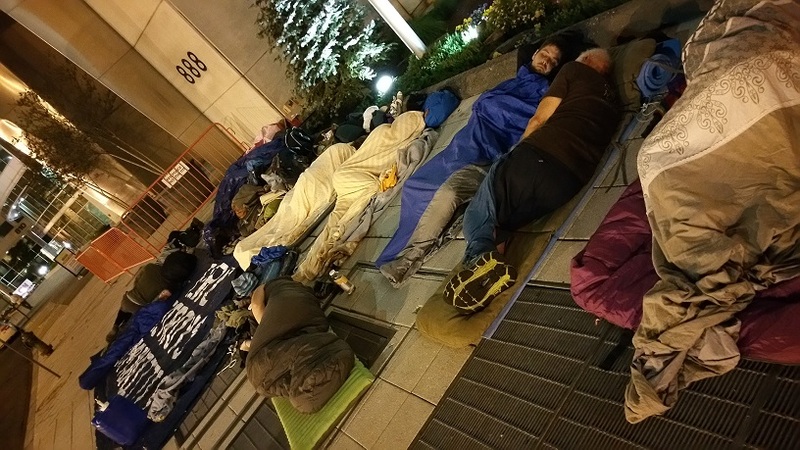 Their die-in demonstration was opening round of “Stop the FERCus”, nine days of non-violent protests and civil disobedience brought by coalitions of citizen groups and their allies from Beyond Extreme Energy (BXE). The Stop the Fercus demonstrations challenge the toxic results of the industry-friendly natural gas policy, where FERC rubber-stamps every fracked gas pipeline and processing project coming before the agency for pre-construction approval. I couldn’t sit this one out – I’m here for my children and grandchildren. They deserve clean air and water instead of a future built on fracking. 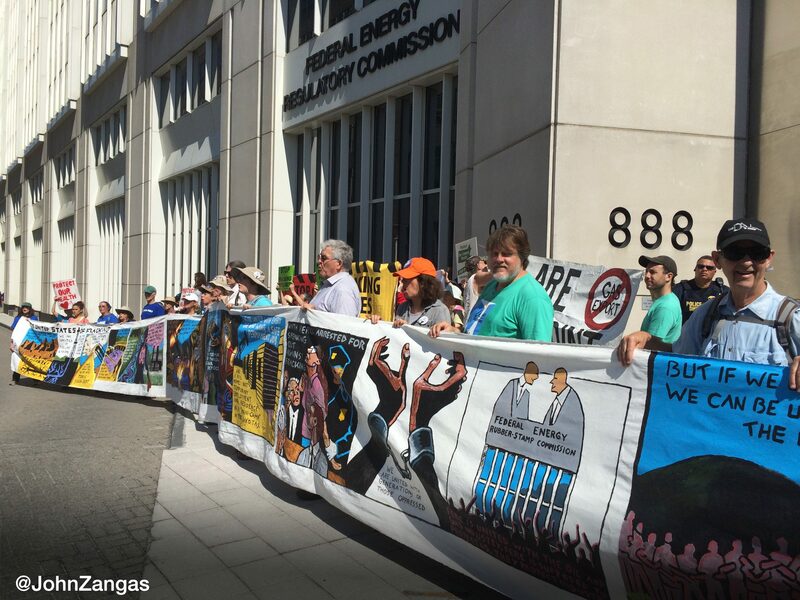 Today’s Stop the FERCus demonstration is the latest in a string of BXE-FERC battles – leading to more than fifty arrests – going back to July 2014, continuing with five days of street demonstrations last November, and monthly disruptions of FERC Commissioners Meetings ever since. 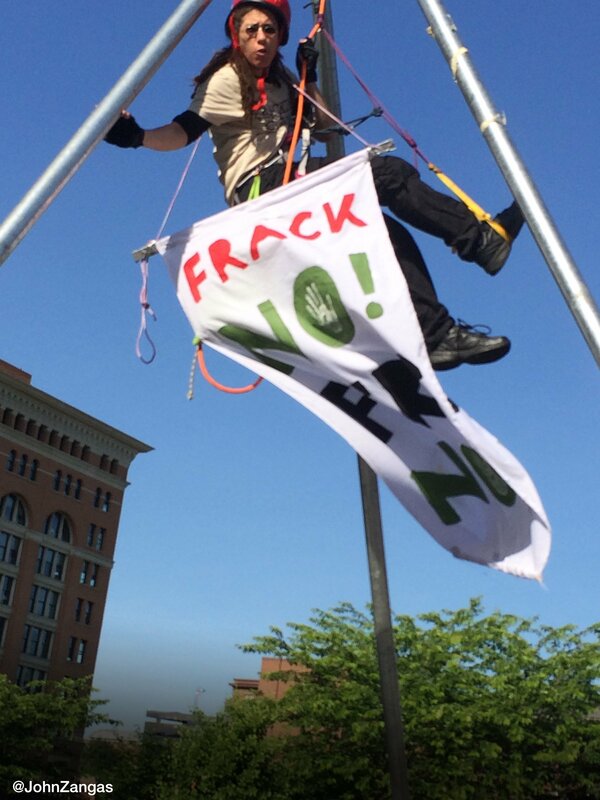 In the latest of these protests, just last Thursday, three BXE activists were arrested, and nearly thirty peaceful concerned citizens, whom the agency – falsely – labeled as “known disruptors”, were evicted from FERC’s headquarters building. FERC’s project reviews are perfunctory; its decisions are licenses to pollute and endanger; its oversight is lax. FERC employees openly discuss job opportunities with industry lawyers and lobbyists in the aisles of the auditorium at Commissioners meetings. 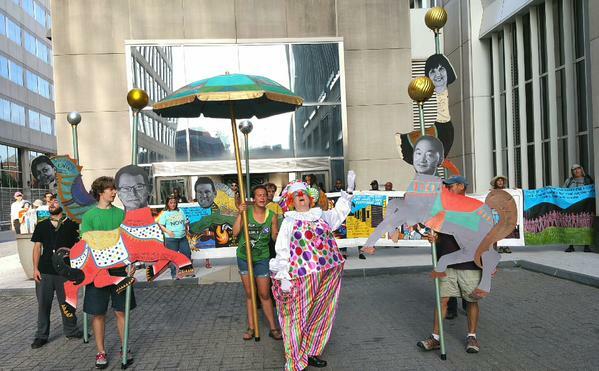 FERC has become a circus – a “FERCus” – run for the benefit of natural gas and other fossil industries. We will be here for another eight days. We will Stop the FERCus. BXE is a network of people and grass-roots organizations formed in 2014 to take non-violent direct action in support of communities in the front-lines of battles against pollution and contamination from fossil fuel projects. 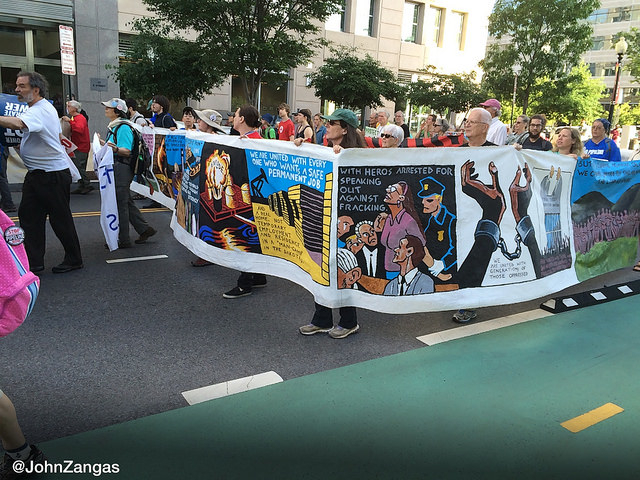 Besides the confrontations with FERC, BXE has helped to organize other non-violent energy and climate-related protests in Maryland, Pennsylvania, and New York City. BXE requires its participants and supporters to sign – and honor – a pledge of non-violence and respect for others before they join the direct actions that BXE organizes and leads.